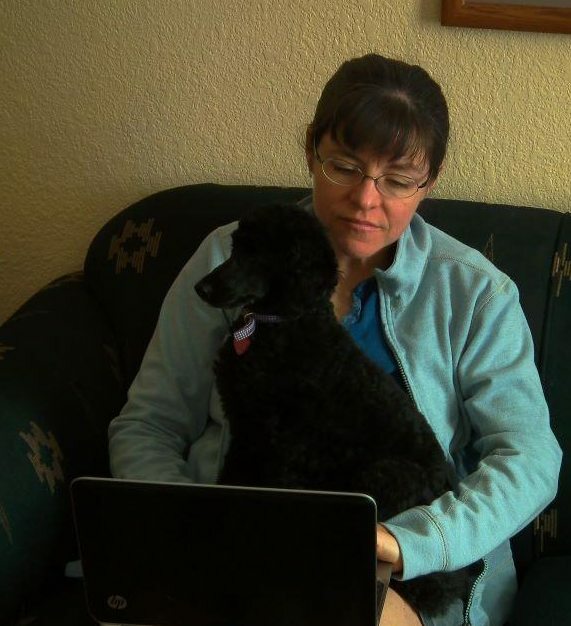 All I need to write is a poodle, a laptop, and the perfect schedule. Or is it? The Advice: Write every day. Write at the same time. Have a routine. The same goes for anyone doing creative work. Treat it like work, show up at the same time, every day, and your muse will learn to meet you there in overalls, ready to whisper instructions in your ear and hand you tools when you need them. I once read an artist’s routine that went like this, only now I can’t find the source. Some creatives are more honest than others and will mention family, errands, and friends. But whenever I am afraid that I will die before I publish a book, The Advice seems like my only hope and I go looking for answers to my struggles to develop a solid routine. And the routines I find always look like the one above. Unfortunately, my Inner Planner totally buys this schedule. Everything happening at the same time, day in, day out, forever. Eating and sleeping are allowed, and lots of dog walking takes place, which sounds fantastic. Look at how much time I’d get to write. I’d be writing eleven or more hours a day. I could write a whole book in a week! The walks are an added bonus. Not only do you stay fit with all that walking, you have the great excuse of taking care of the dog when you are really wandering aimlessly, staring into space, thinking about the next scene you need to write. Heaven! I’m sure you can see the problem that my Inner Planner wants to ignore: most of my life is not anywhere on that schedule. No groceries or cooking or laundry. No visits to the dentist or doctor. No phone calls, e-mails, tweets, or bills. No birthdays to remember, prescriptions to re-fill, or appointments to make. No showers. No haircuts. No flossing. Not even personal hygiene can interfere with this impossibly perfect dream schedule. And yet, I hear the siren call of this dream. To have massive amounts of my day just to write sounds ideal. And even as I am writing a blog post about it, my husband comes in. Kurt: Frost warning tonight. Can you pick raspberries? Kit (giving him a totally undeserved withering stare): Maybe. Kurt (apologetically): I have to change the oil in the compressor so I can blow out the sprinkler system before I leave for tennis. Kit (sighing and saving her file): I’ll pick raspberries. I only had six minutes left before I was supposed to go start cooking dinner anyway, so it wasn’t really that much of an interruption. I lost maybe 20 minutes I might have been able to spend writing, but the raspberries couldn’t wait and my blog could. But in the moment, when my Inner Perfectionist was screaming that I’ve only managed one blog post all month despite my new goal to blog regularly, I wanted to fling my laptop across the room. And there was no question of writing more later. My entire evening was booked. I should also stop expecting myself to be someone I’m not. The advice to write at the same time every day may be fantastic advice for some, but not for me. I cannot sustain the same schedule day in, day out. My Inner Planner can’t figure out what is wrong with me, but the fact is my daily energy cycle isn’t fixed. Some days I work best in the morning, other days afternoon or even evening are my most productive times. I have to be able to adapt on the fly. The trick is being willing to. I was relieved when I heard Natalie Goldberg say that she can’t sustain a fixed writing schedule for long. She might find a schedule that works well for a day or a few days or a week, but then it doesn’t work any more and she’ll have to try something else. The key for her isn’t when she writes, but that she writes every day she can. And that’s where all this leads me. I can’t nail down what I’ll be doing at 9 AM for the rest of my life. But I can decide what I am going to do with the moment I am in. I will write today, whenever I can, and call it good, even if it means rescuing raspberries instead of finishing my blog post. Do you have scheduling frustrations? Advice “everyone” follows that just won’t work for you? How do you deal with it? I track my writing time with a stopwatch, too, and I set goals for myself every week. Some weeks they are based on word count, sometimes I focus on hours of effort instead. I’d like to say I always meet my goals but of course I don’t. Unexpected stuff can take over the week. When it does, I pick myself up, dust off, and just set a new round of goals. Even when I don’t hit them, I find I get more done because I was at least aiming for something than if I just said “oh I guess I’ll write some this week”. Hi Cathy, Enid here. Nice to find you writing and musing on a topic I also would like to explore. I splice writing into spaces not otherwise filled, for the most part. However, when I have something to say I find I just sit down and pound it out and ignore everything except the dog, who doubles as “she who will not be ignored”. I look forward to hearing how you sort out the contrast between the ideal “lots of time to write” and the real world of things that need to be done. For me, a lot of the writing work happens when I am washing apples, or walking the dog. If it hangs together, I can remember it when I get back to the keyboard. Hey, Enid! One thing I didn’t mention (maybe another post?) was the need for space — mental and physical — as well as time to be creative. Making that time by taking advantage of mindless tasks (like washing dishes, or apples!) to think about my writing project is one way to get some of my day back. I know I do better when I go through my day jotting down ideas. It means I’m already warmed up when I finally get to the keyboard. Great to hear from you! I’m a fan of the steady drip technique. Doesn’t matter when it happens, as long as it happens regularly. Or taking a bath. If I let myself just sit in a bath without reading, I usually get out with a great new idea, ready to go.